I have made it this far, but I’m disappointed. I’m sorry to say it, but that’s the honest truth. But deep down inside, I always believed I wasn’t doing all I could. I realize now I’ve harbored a cherished myth that if I could just eat perfectly, all my health complaints ever would go away. Whatever “perfectly” means. When I was a teen, my mom would go through health food diet fads with pamphlets and articles and flyers and cookbooks all about how diseases could be cured and prevented, vision would revert to 20/20, acne cleared up, minimal body fat and best of all no menstrual period (typed like a chick, eh?) – all just from eating the perfect diet. (I.e., whichever diet made them money!) I thought I got so close with the “paleo” diet, and closer still when I cut further back on processed and natural sugar. But I just couldn’t let go of the dairy. And now I have, and it’s still not enough. Oh don’t get me wrong. I can breathe – and that’s very important! In fact, I was able to stop taking my antihistamine / pseudoephedrine cocktail two days after I cut dairy out. But so many dairy-free food bloggers tout the amazing effects they experienced removing the milk products, I had hoped for… well… more! Friday night, after 15 days, I will reintroduce dairy as dramatically as possible. Pizza with mozzarella and pepperoni on an Against the Grain crust (which is made largely from cheese). 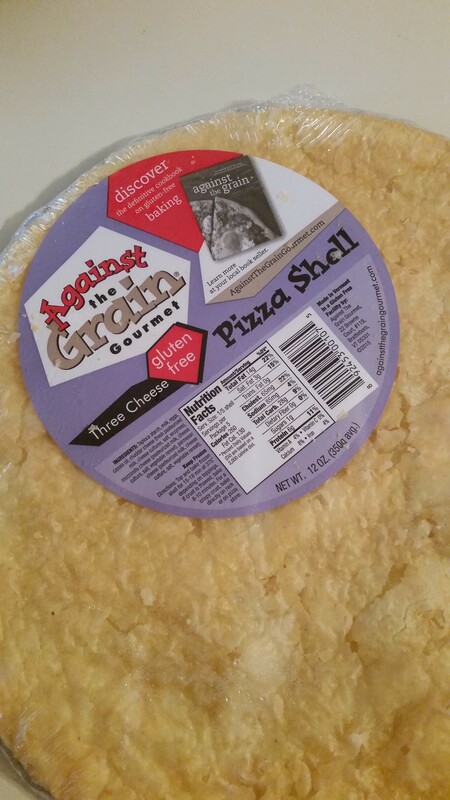 A brief shout-out to Against The Grain Gourmet for offering a pizza crust, in addition to their selection of frozen pizzas! If this dairy allergy of mine isn’t psychosomatic, symptoms should come flooding back in a wave of Immunoglobulin E. We’ll see if there’s anything besides the sinus congestion that I didn’t even realize was missing until it is reintroduced! Categories: Cooking, Health | Tags: allergy-free, dairy-free, health, paleo | Permalink. Well, what did you replace the dairy with? When I changed my diet, I found the new food was tastier and easier to make, made me feel better, and was cheaper. A perfect system, no downsides! A few months back I ate at Ledo’s Pizza with my stepdaughter, who ordered a pepperoni pizza. I can’t imagine how I ever ate the stuff! As for not achieving perfection… well, aging has something to do with it :-(. I have noticed it too. My sister tells her 18-year-old son to enjoy youth while he has it…. but of course he doesn’t know what she’s talking about. Youth, wasted on the young. Aside from swapping out coconut milk yogurt for regular yogurt, and other solid fats for butter, I haven’t “replaced” the dairy, I’ve just left it out. So making recipes where cheese can be left out easily, and avoiding recipes for which the dairy is integral. I’ve inadvertently cut back on carbs because most of my starchy treats (like grain free buttermilk biscuits) relied so heavily on dairy products!